I am a yogurt lover, as well as my children. with sides of that foil sticking out. 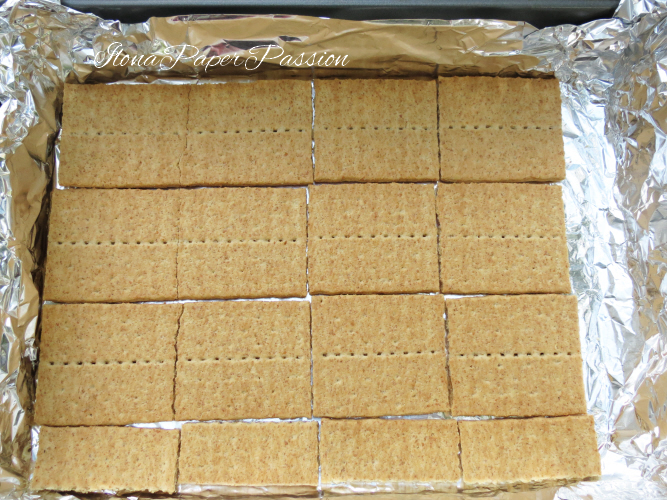 Lay grahams on the bottom of the pan. Please see picture how I did it. Wash cherries and remove stem. Cut each cherry in half and pop out the pit. Transport them to the blender and make a puree. Set aside for now. Put m&m’s into bag and crush with hammer. In a large bowl beat heavy cream, when it will start to thicken add sugar gradually. Beat until well combined and heavy cream is thick. Add Greek yogurt, cherry puree and m&m’s. Fold all ingredients together with a spoon. Pour mixture on the grahams, put nicely grahams on the top. Freeze for 5 hours. Take out from the freezer, lift them up and cut nicely into squares. Please remember that on the next day ice cream sandwiches will be very hard, so it is best to take them out from the freezer about 5-8 minutes before serving.